Some of my favourite memories are from road trips taken with my dear friend André Leduc. We met in the lobby of Jane Mallett Theatre at the intermission of an Esprit Orchestra concert sometime in the mid-1980s. I was already well versed in the 20th-century canon, and was quickly drawn to the outgoing personality of this musical naïf whose curiosity about the subject seemed boundless. I told him about my radio show Transfigured Night on CKLN-FM and he told me about his work as a commercial photographer. We became fast friends and later travelling companions. Our journeys most often have contemporary music at their heart – Montreal for the founding of the Canadian Electroacoustic Community, Ottawa for QuartetFest, Montreal again (and again) for a number of festivals and conventions – although our trip to Quebec City and on up the north shore to Sainte-Anne-de-Beaupré and beyond to see the arrival of the snow geese, was strictly a pleasure outing as I recall. But there is always an aspect of modern art involved too, with gallery visits an integral part of our adventures. One memorable trip around the turn of the new millennium combined these two shared loves in a most wonderful way. The timing of our visit to Montreal on that occasion coincided with a retrospective tribute at the Montreal Museum of Fine Arts to Jean-Paul Riopelle who had died earlier that year, and a concert by Quatuor Molinari featuring one of our shared favourites of the genre, Lutosławski’s String Quartet. 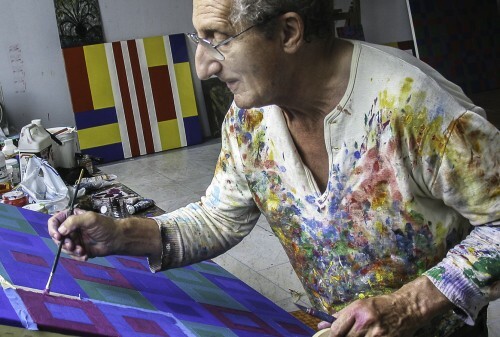 An unintended highlight of that trip was meeting the artist who was the namesake of the quartet, Guido Molinari and spending time in his studio. This was at the instigation of founding first violinist Olga Ranzenhofer who, charmed by my friend, encouraged us to “give Guido a call” when she found out our interest in contemporary visual art. We did, and found him to be a most amiable host, generous with his time so long as we were willing to wait while he put a few more brush strokes on “before the paint dries.” That is when André took the photo seen here of Molinari at his work bench. On many of our trips, and during two decades as photographer for New Music Concerts before retiring, André captured some of the most significant musical voices of our time. You can find his book of Canadian composer portraits, Composers In My Lens, at musiccentre.ca/node/144800. One of my “trips of a lifetime” on which André did not accompany me, was a ten-day visit to Iceland in 2012 with my wife Sharon at the invitation of New Music Concerts’ colleague Robert Aitken and his late wife Marion. Of course there was music and art involved – Bob seems to know every composer and musician on the island and is also an aficionado of modern art – but also museums. Iceland seems to have a museum for everything, including expected topics like Vikings, glaciers, volcanoes and whales, but some surprising off-beat subjects as well, like punk music, herring and penises (Icelandic Phallological Museum) – we did not visit that one. It was an amazing trip in the last days of June and early July, with the sun barely disappearing below the horizon for an hour each night. Although we did not circumnavigate the island, we did travel to many of the (incredible) landmarks including Snæfellsjökull, a 700,000-year-old glacier-capped stratovolcano which was the starting point of The Journey to the Centre of the Earth in Jules Verne’s novel; Thingvellir National Park, home of Althing, the world’s first parliament which was convened there in 930 and continued on that site until 1798, and is also the meeting point of the North American and European tectonic plates which are gradually moving apart at a rate of a millimetre or two per year; a number of unbelievable waterfalls, various hot springs and geysers and the black sand beaches of Vik. Most striking was the stark, treeless landscape and the barren hillsides dotted with Iceland’s miniature horses and endless sheep. And why am I telling you all this? I believe that trip gave me the background to truly appreciate the starkness of the next disc. 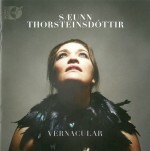 Icelandic-born cellist Sæunn Thorsteinsdóttir has just released Vernacular (Sono Luminus DSL-92229 saeunn.com/vernacular) which includes world premieres of solo works written for her by three of the current generation of Icelandic composers, and a contemporary classic by senior composer Haflidi Hallgrímsson (b.1941). Composer Hallgrímsson is a cellist in his own right (and incidentally was in the trio ICE with Robert Aitken and composer/pianist Thorkell Sigurbjörnsson during the 1970s). He composed Solitaire for solo cello in 1969 and it was his first published work, later revising it to its current form two decades later. 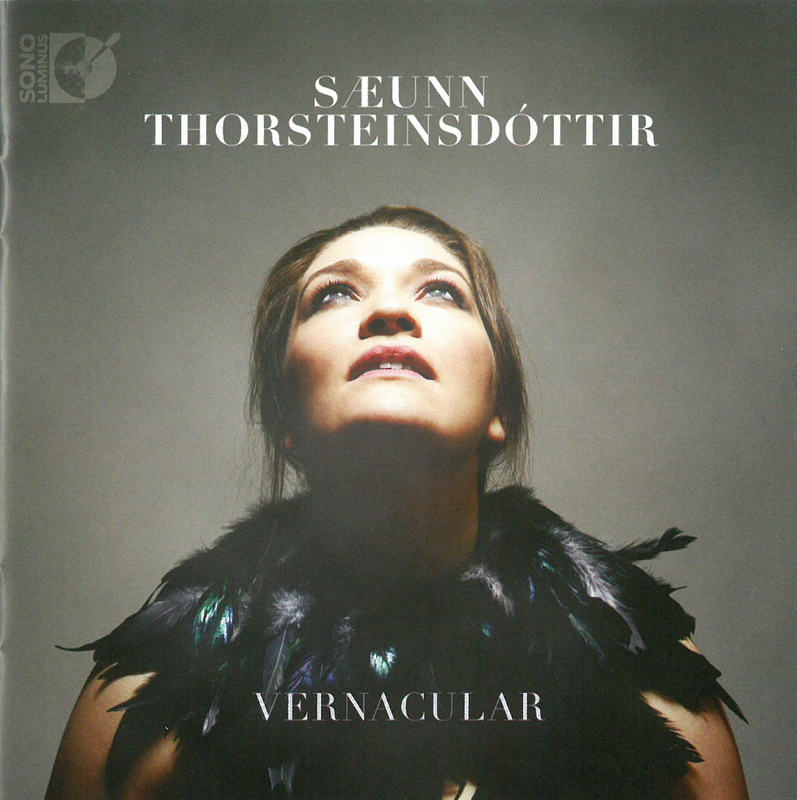 Thorsteinsdóttir says that from the first time she played the work she felt a connection “not only to the music, but also beyond the music.” The idiomatic writing is like “playing [with Hallgrímsson’s] hands… getting to know a fellow musician in this physical way is satisfying and humbling at the same time.” After the extremes of the first three pieces on the disc, Solitaire is a welcome relief. A five-movement work, it opens with Oration employing simultaneous left-hand pizzicato beneath a soaring bowed melody. Serenade is played entirely without the bow while the central Nocturne is richly melodic in a meditative way. 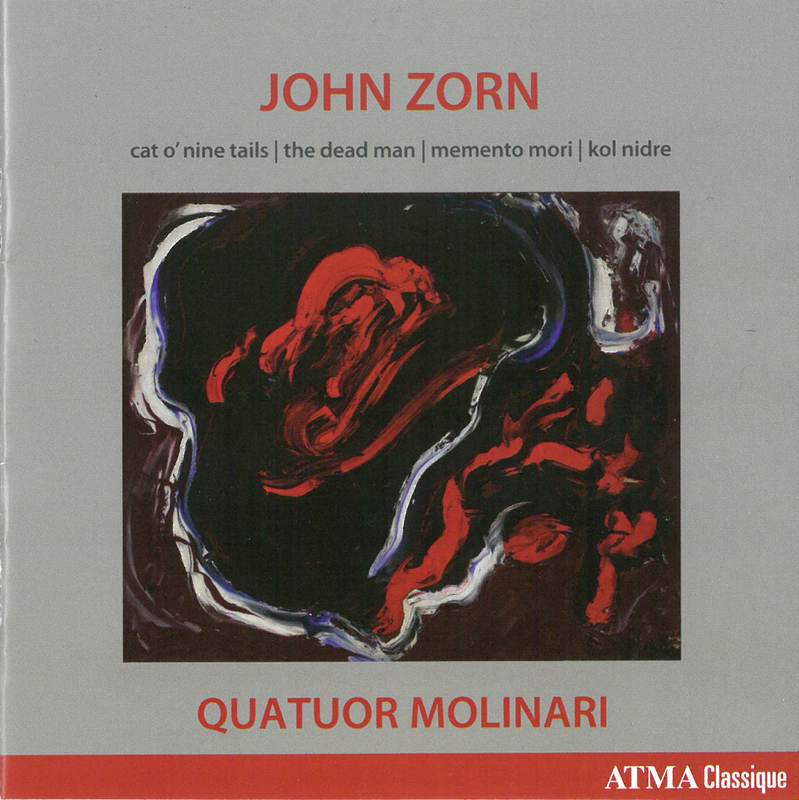 This is followed by a Dirge which the composer says “is lyrical in nature and hints at darker thoughts, leading eventually to the last movement which is a lively and energetic Jig.” This performance makes clear why Solitaire is regarded as a seminal and significant exploration of “the sound world… available to the contemporary cellist,” at least as perceived in 1969. As mentioned, the recent works on this recording explore more extreme notions. 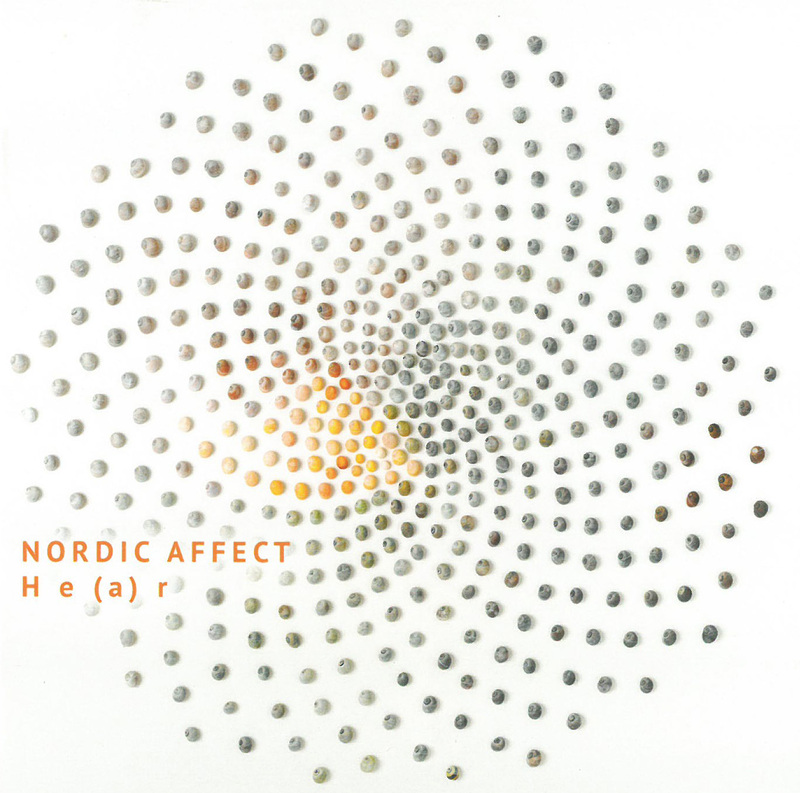 The disc begins with Páll Ragnar Pálsson (b.1977), a rock musician who has recently come to the world of art music. He studied with Helena Tulve at the Estonian Academy of Music where he received a PhD and in 2017 released his first album as a composer. In 2018 his Quake for solo cello and chamber orchestra was a selected work at the International Rostrum of Composers in Budapest, which marked his first collaboration with compatriot Thorsteinsdóttir. The solo work Afterquake is a direct outgrowth of that project. This is followed by 48 Images of the Moon by Thurídur Jónsdóttir (b.1967), which combines solo cello with quiet natural sounds from a field recording made at night in an Icelandic fjord by Magnús Bergsson. The entire piece takes place in barely audible gestures with only a rare pizzicato pop rising above the field. Halldór Smárason (b.1989) contributes a three-movement work simply titled O. Thorsteinsdóttir tells us that “In Iceland, darkness in the winter months has created a need for light and warmth for centuries, and candles continue to be a source for both. This piece explores the meaning and associations with the intimacy, warmth, and the wild yet contained energy of the light of the candle and its effect on the darkness surrounding it.” As effective as this depiction is, it only makes me the more content to have visited Iceland during the days of the midnight sun. 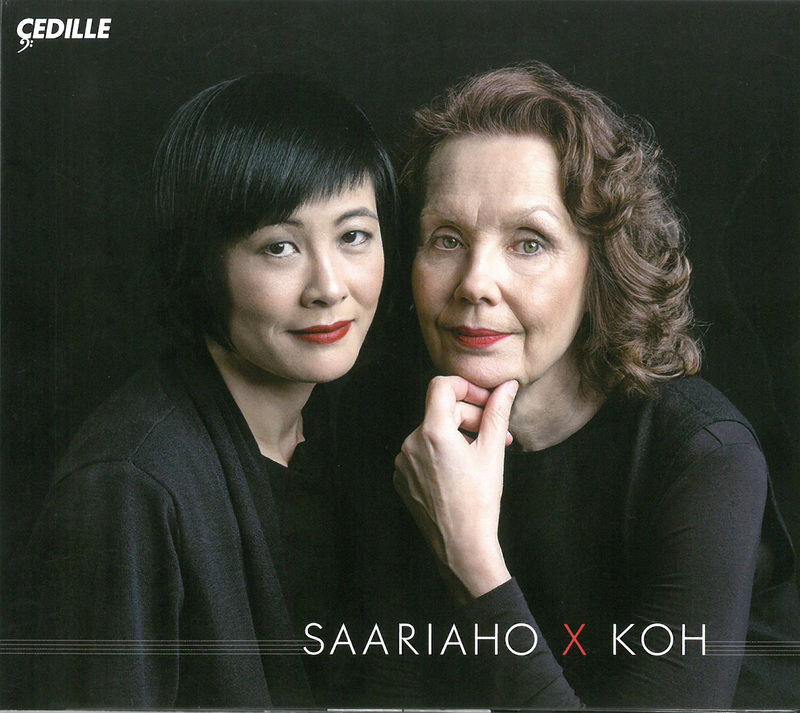 This month’s final disc also contains new works for solo cello, but with a very different premise. 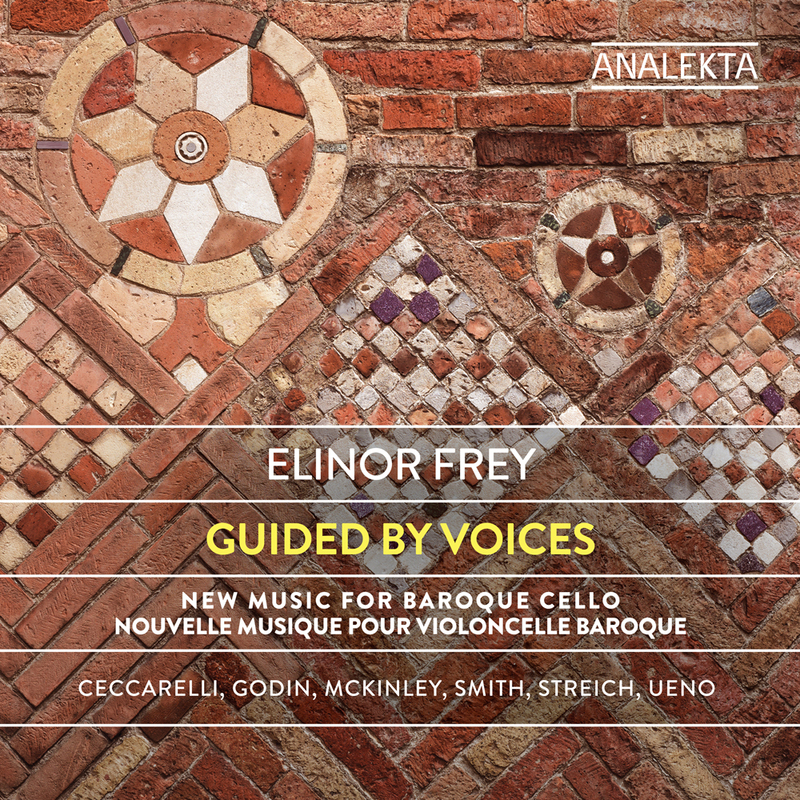 Guided by Voices – New Music for Baroque Cello (Analekta AN 2 9162 analekta.com/en/) features works written for Elinor Frey. 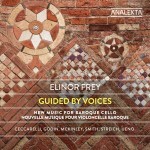 Frey, an accomplished cellist comfortable in the music of all eras but particularly known for her early music acumen, says: “When modern composers write a new piece for ‘Baroque’ cello it becomes an instrument of today, helping to expand the sound worlds of both the cello and new music audiences.” The breadth of vision and diversity of voices represented here certainly support this. Scott Edward Godin’s piece, which gives the album its title, “draws inspiration from the life and oeuvre of Saint Hildegard of Bingen, […and] exploits the obsessiveness found within recurring melodic units of Hildegard’s music, deconstructing these units before reconstructing them in a new musical framework.” Those familiar with Hildegard’s long, sustained melodies may be surprised by the level of activity in Godin’s creation, but strains of her melodies do peek through the busyness. 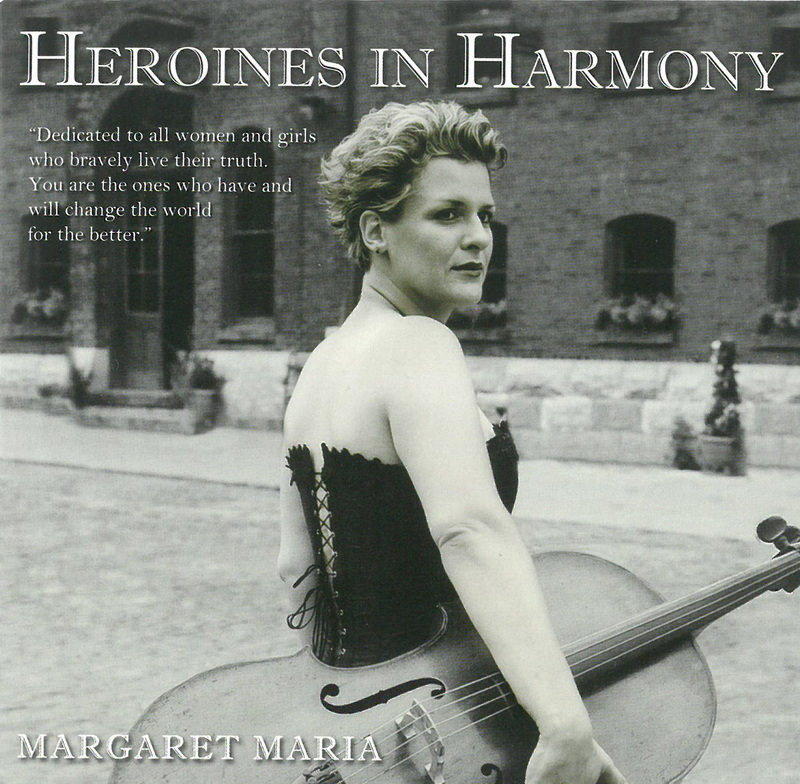 Minerva, says composer Lisa Streich “imagines a goddess who, almost like an octopus, helps with or stands for many things at once – a goddess of everything. She reminds me of the human being of the future, a human fully endowed with equal rights, who, according to Global Gender Gap Reports, should exist in 217 years.” Frey dedicates her project to Maxime McKinley with gratitude for his “humour and kindness.” McKinley’s own contribution, Cortile di Pilato, was inspired by a courtyard in Bologna surrounded by the Basilica of Santo Stefano, a complex of four churches built on a foundation begun in the fifth century that was itself built on a temple dedicated to the Egyptian goddess Isis. He says: “I was interested in the ‘copresence’ of different epochs in the same place that create a thread among many centuries. This pleased me, particularly when writing a piece for Baroque cello and harpsichord.” For this performance Frey is joined by Mélisande McNabney. Like the McKinley, Linda Catlin Smith’s Ricercar was commissioned with the support of Toronto philanthropist, the late Daniel Cooper. It is perhaps the most “Baroque” of the pieces on offer here; played with little or no vibrato, the melody gently unfolds and grows. But gradually it expands through other sound worlds as the melody is supported by double and triple stops that produce some close harmonies, some wide interval jumps and, toward the middle of the piece, a driving rhythmic pulse. This eventually gives way to a quiet section before building dramatically again and receding once more. Ken Ueno says Chimera “is a kind of meta-suite in five movements, one that traverses time. Starting with a contemporary recasting of a prelude, the following movements gradually approach a ghost of the Baroque.” Frey seems at home in all the realms this journey presents her with, be it just intonation, microtonality, hectic virtuosity or stasis. It is our good fortune to accompany her. We invite submissions. CDs and comments should be sent to: DISCoveries, WholeNote Media Inc., The Centre for Social Innovation, 503 – 720 Bathurst St. Toronto ON M5S 2R4. Ratamacue! is one of the exclamations that the percussionist is called upon to ejaculate during Chanter la pomme (to flirt/to seduce) for snare drum. 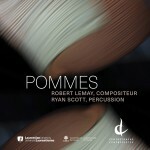 This is the first of eight short pedagogical exercises in the collection Pommes by Robert Lemay recently recorded by Ryan Scott and released by the Canadian Music Centre’s digital arm Centretracks (CMCCT 11218 musiccentre.ca/node/154883). The digital EP is the result of an ongoing collaboration between the Sudbury-based composer and one of Toronto’s leading percussion soloists. Pommes is a series of études for solo percussion instruments, four for snare drum, one for temple blocks, one for toms, one for tam-tam and one for bass drum. The title refers to the percussion sound POM, but also to the apple (the fruit). Each piece has a title that includes the word “apple” in French (pomme). Only the exuberant first includes vocalizations by the performer, but all require dexterity, precision and control. One might wonder whether a solo percussionist using just one (non-pitched) instrument for each exercise could sustain interest over the cumulative duration of roughly 20 minutes. I’m pleased to say that it is indeed possible, and in fact the result is quite entertaining. Of particular note are the delicacy of Tomber dans les pommes (to pass out) for temple blocks, the deep gong’s resonance of Pomme d’Adam (Adam’s apple) for tam-tam and the intensity of La grosse pomme (The Big Apple) for bass drum, which juxtaposes the low rumble and “pomming” of the skin of the drum with rhythmic patterns of rim shots. All in all, an exuberant adventure leading me to believe, as I have always suspected, that being a drummer must be a lot of fun! 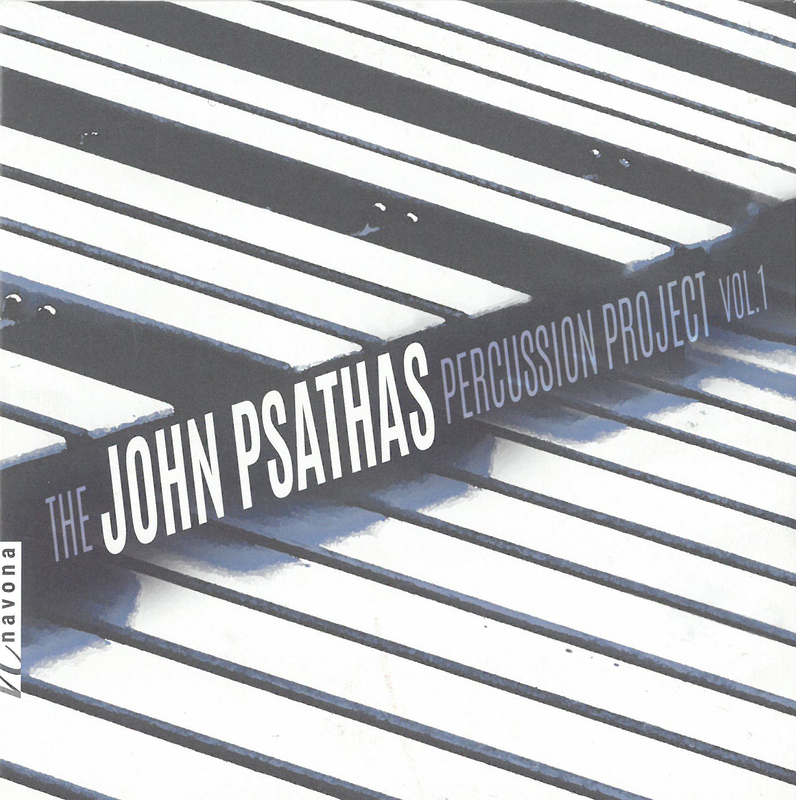 Sticking with a theme, John Psathas – Percussion Project Vol.1 (navonarecords.com/catalog/nv6204) is the culmination of another composer/percussionist collaboration that began in 2013 when Omar Carmenates arranged Psathas’ piano and gamelan piece Waiting: Still for percussion trio. Psathas is a Greek-New Zealand composer and in the past five years a number of his chamber works have been arranged for percussion ensemble by Carmenates, an American, who directs this project and is the featured soloist in a number of the works. 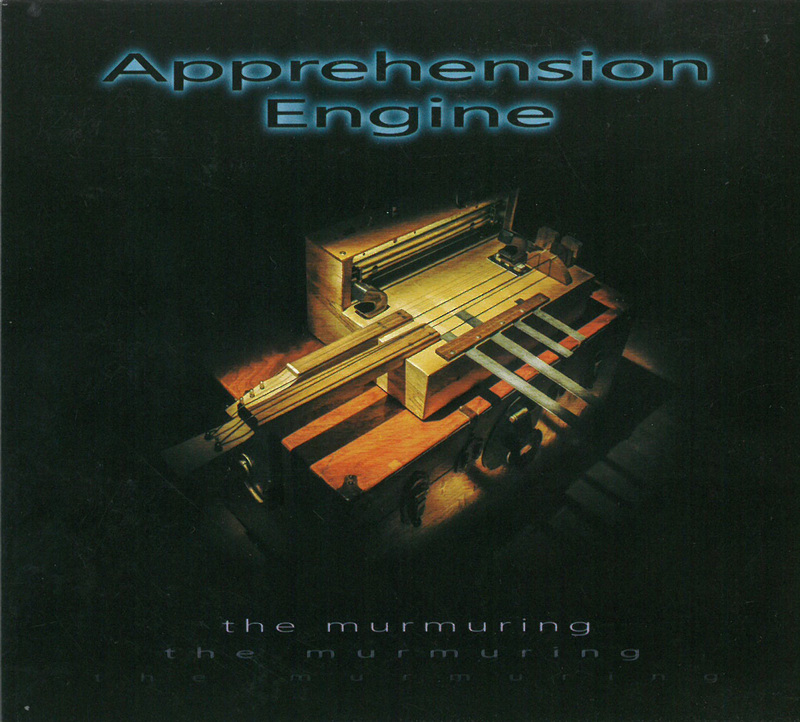 There are 10 members of the nameless percussion ensemble involved throughout the disc, so there is no question of monophony in this instance – just about every sound imaginable from a percussion instrument turns up somewhere on the disc. But a few of the pieces employ fewer, similar instruments such as Musica scored for two players, Carmenates on vibraphone and a different partner on marimba in each of the three movements: Soledad, Chia and El Dorado. The disc begins with the full ensemble work Corybas which started out in life as a traditional piano trio. It opens with a gentle ostinato of mallet instruments overlaid by a lovely vibraphone melody. This eventually gives way to a raucous section where unpitched instruments come to the fore before gradually subsiding into a calm finale with low marimba notes, bowed vibraphone drones and a high chiming melody. The second work, Piano Quintet, also began as a piece for the standard formation named in its title, but in this instance the piano (played by Daniel Koppelman) is retained in the transcription, and the strings are replaced by percussion instruments. Again there is a wealth of ostinati, but not in the minimalist sense of strict repetition with minor variations. The work is multilayered in the extreme with different voices rising out of the murky textures, often to beautiful effect. Drum Dances, commissioned by Dame Evelyn Glennie for drum kit and piano, features Justin Alexander in the starring role, with the piano accompaniment here transcribed for mallet instruments and a variety of other pitched and non-pitched beaters. 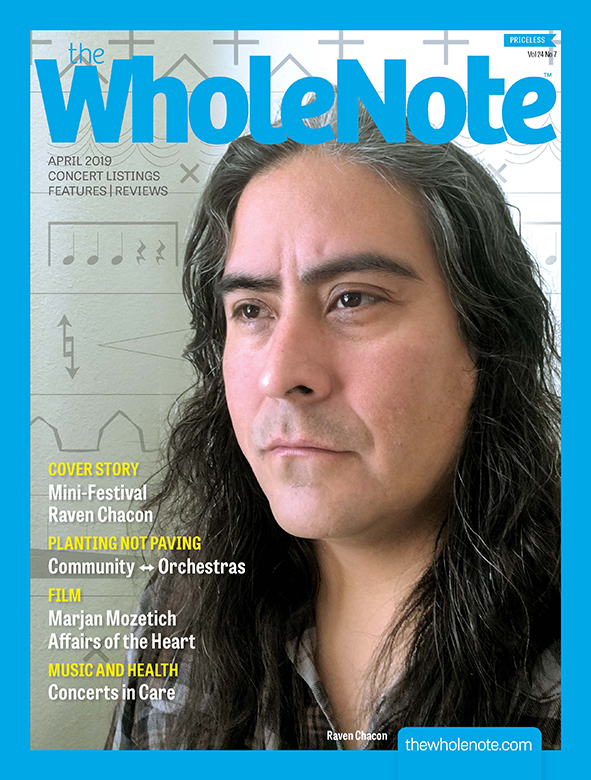 Psathas says he was “greatly inspired by the drumming of Dave Weckl, the very different piano styles of Keith Jarrett and Chick Corea, and the enormous energy in the music of guitarists like Steve Vai.” There is great energy and great beauty in these dances, and all throughout this disc. John Psathas: Percussion Project is a good reminder that the modern percussion arsenal is vast and varied, and that although studies may begin with intriguing exercises like those devised by Robert Lemay as mentioned above, this merely scratches the surface of a wild and wonderful world that can include anything that can be struck, bowed or beaten, sometimes including the kitchen sink. A good example of this will be seen at New Music Concerts’ April 28 presentation “Luminaries,” a tribute to two masters of 20th-century composition who passed away in recent years, Pierre Boulez and Gilles Tremblay. 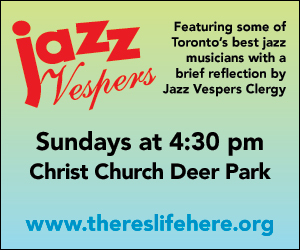 Ryan Scott will be one of three percussionists involved in the concert along with Rick Sacks and David Schotzko. Both Boulez’s Le Marteau sans maître (with mezzo Patricia Green) and Tremblay’s piano concerto Envoi (with soloist Louise Bessette) are scored for three percussionists, although in very different ways. In the Boulez, one player is assigned the rare xylorimba throughout (Scott), another vibraphone (Sacks), and only the third (Schotzko) plays on a variety of instruments from the percussionist’s “kitchen.” In the Tremblay all three have extensive set-ups. It should be quite a sight. And speaking of New Music Concerts as I am wont to do – I’ve been general manager there for the past 20 years – I am writing this the morning after a stunning performance at Gallery 345 by young German pianist Moritz Ernst. The evening was NMC’s annual benefit concert, in this instance a recital that included music of Sandeep Bhagwati (who was in attendance and gave an insightful introduction to his complex work Music of Crossings with examples provided by the pianist), Karlheinz Stockhausen, Michael Edward Edgerton (a piece written for Ernst), Miklós Maros and Arthur Lourié. 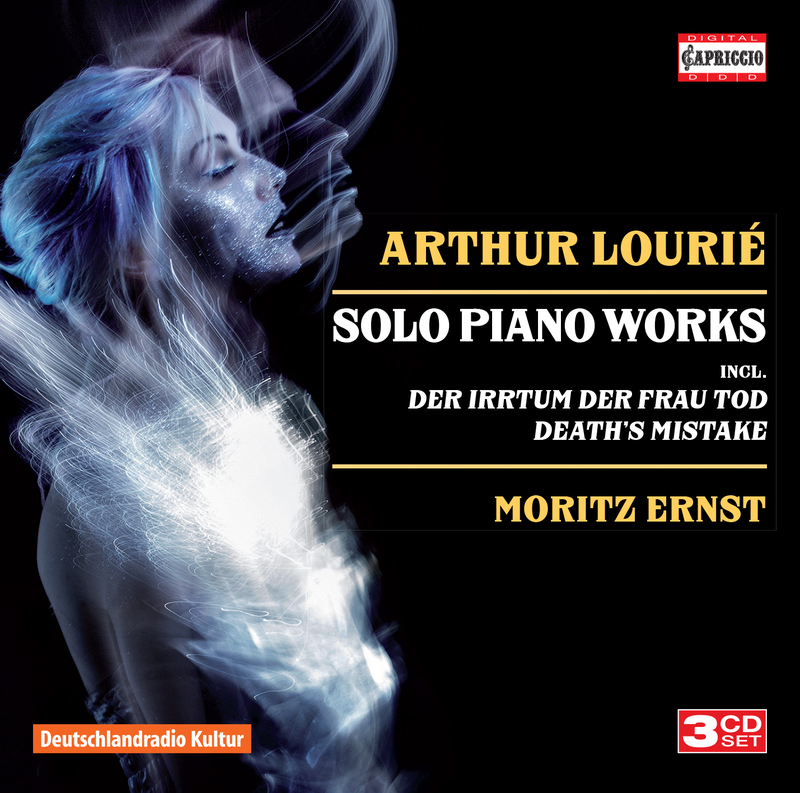 In 2016 Ernst’s recording of the complete Solo Piano Works of Arthur Lourié was released by Capriccio (3CDs C5281 naxos.com/catalogue/item.asp?item_code=C5281). Lourié played an important role in the earliest stages of the organization of Soviet music after the 1917 Revolution but later went into exile, failing to return from an official visit to Berlin in 1921. His works were thereafter banned in the USSR. His music reflects his close connections with contemporary writers and artists associated with the Futurist movement. In 1922 he settled in Paris where he maintained a close relationship with Igor Stravinsky, and then fled to the USA in 1940 when the Germans occupied the city. He settled in New York and wrote some film scores but gained almost no performances for his more serious works. An exception to the chronological order of the first two CDs, the third disc of the set concludes with a 1917 setting of an “absurdes dramolette” for piano and speaker entitled Der Irrtum der Frau Tod (Death’s Mistake), a half-hour-long monodrama by Velimir Chlébnikov. For this dramatic recitation Ernst is joined by Oskar Ansull. Although narrated in German, there is a full translation in the accompanying booklet. Ansull is also featured on CD2 in the peculiar Nash Marsh (Our March) from 1918 which is a strangely lilting “march” in 3 / 4 time. This collection is an important addition to the discography, and to the awareness of an innovative and once-influential composer whose legacy virtually disappeared after falling out of favour with the Soviet regime. Congratulations to Moritz Ernst for embracing lesser-known repertoire. 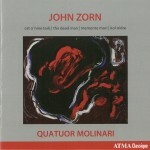 His discography also includes music of Walter Braunfels, Viktor Ullmann, Norbert von Hannenheim and Sir Malcolm Arnold. Also Joseph Haydn! As Ernst explains in an interview with composer Moritz Eggert in the notes for Volume One of a projected 11CD edition of the complete solo piano works of Haydn (Perfect Noise PN 1701), the keyboard music of Haydn remains surprisingly under-recorded with the exception of a very few sonatas. Thanks also to Ernst for gracing a very appreciative audience at Gallery 345 with his insights and extraordinary skill.